This is the one most often requested by the great lakes fishermen and fisherwomen! 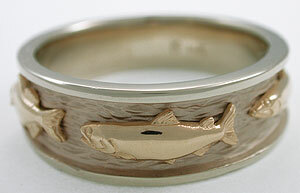 A grand slam fish ring depicting a walleye, salmon and pike. If you are telling stories along the docks of Put In Bay, this ring is all the proof you will need! 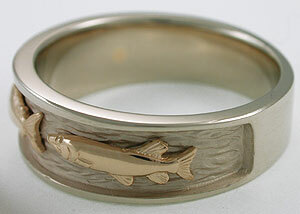 Any combination of 14kt, 18kt, yellow gold, white gold or platinum for your Great Lakes fishing grand slam ring. 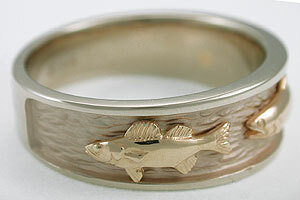 This one as shown is $1,025.00 14kt yellow fish on 14kt white gold ring. The ring is 8.5mm at the widest point. The setting for the fish is waves recessed into the wall of the ring. The dark spots you see are the reflection of the camera lens. Custom design your own personal Great Lakes grand slam fish ring! Select your fish and color combination, set the hook and wait for it to arrive! back to sport fish jewelry!